The alphabet network has announced the return dates of Rookie Blue (season three), Secret Millionaire (season three), Wipeout (season five), Bachelor Pad (season three), and Extreme Makeover: Weight Loss Edition (season two). The network hadn’t announced an official renewal of the latter but, because episodes are filmed over the course of many months, ABC ordered additional episodes all the way back in September. In addition, the network has announced the series premieres of Duets, Trust Us With Your Life, and Final Witness. THE BACHELORETTE – PREMIERES MONDAY, MAY 14 (9:30-11:00 p.m.) Emily Maynard, the beautiful, sweet, young mom who captured America’s and Brad Womack’s heart on the 15th season of “The Bachelor,” finally thought she had her happy ending. She accepted Brad’s proposal but unfortunately their relationship ended, along with her dream of moving to Austin with her daughter, Ricki, and starting a family. But Emily, 26, is ready for her luck to change and to bring her the love she so richly deserves. It’s hard to meet men as a single mom, but Emily will have her pick of 25 bachelors when she gets a second opportunity to find love starring in the eighth edition of “The Bachelorette.” Instantly popular with “Bachelor” fans, Emily’s strength, passion and southern charm – as a mother and as a woman – would make anyone happy to make her his wife. She feels incredibly grateful to have found her first love when she was very young, although her fiancé, famed NASCAR driver and team owner Ricky Hendrick, tragically died in a plane crash. She then discovered she was pregnant with their child, the apple of her eye – Ricki. Despite not having dated a lot, Emily knows what it’s like to be truly in love. In the past seven years, she has been looking for someone with the same spark she has for life, and she believes that she will find her soul mate on “The Bachelorette.” Chris Harrison is the host. “The Bachelorette” is produced by Next Entertainment in association with Warner Horizon Television. Mike Fleiss and Martin Hilton are executive producers. DUETS – PREMIERES THURSDAY, MAY 24 (8:00-10:00 p.m.) “Duets” is a one-of-a-kind singing competition that takes the Superstars out from behind the judges’ panel and onto the stage. Kelly Clarkson, Jennifer Nettles, Lionel Richie and Robin Thicke set out on individual journeys across America looking for undiscovered talent worthy of being their protégés. Ultimately, each Superstar will choose two singers for their duet partners, and together the Superstars and their protégés will take the stage each week and perform in front of a live studio audience. In the end, only one duet will be at the top of the charts, and the winning amateur will receive a recording contract with Hollywood Records. “Duets” is a production of Keep Calm and Carry On Productions. Emmy winner Robert Deaton (“The CMA Awards”) is executive producer. Emmy winner Charles Wachter (“Jamie Oliver’s Food Revolution”) is co-executive producer. ROOKIE BLUE – PREMIERES THURSDAY, MAY 24 (10:00-11:00 p.m.) A group of young and ambitious rookie cops continue to navigate the emotional trials and tribulations of their professional and personal lives. After two years on the job, these rookies are well on their way to becoming experienced cops, but at what cost? What price will they have to pay, both professionally and personally, to succeed at their job? And how can they stay true to themselves – maintaining their individuality and compassion — along the way? While a new rookie — ex-soldier Nick Collins, who is trying to adapt to policing after serving in Afghanistan — has joined 15 Division, the rest of the rookies are now entering their third year on the job. They have overcome the sophomore curse — that a little knowledge is a dangerous thing. However this year the rookies of 15 Division are going to learn to be careful what they wish for – and they’re going to learn it the hard way. Emmy Award winner William Shatner (“Boston Legal”) guest stars on the premiere as Henry McLeod, a belligerent drunk driver with a haunting secret. “Rookie Blue” stars Missy Peregrym as Andy McNally, Gregory Smith as Dov Epstein, Charlotte Sullivan as Gail Peck, Enuka Okuma as Traci Nash, Travis Milne as Chris Diaz, Peter Mooney as Nick Collins and Ben Bass as Sam Swarek. Also starring in the series is Melanie Nicholls-King as Noelle Williams, Matt Gordon as Oliver Shaw, Noam Jenkins as Detective Jerry Barber and Lyric Bent as Frank Best. Tassie Cameron, Ilana Frank, David Wellington, Noreen Halpern and John Morayniss are executive producers. “Rookie Blue” is produced by ICF Films Inc. and Entertainment One. SECRET MILLIONAIRE – PREMIERES SUNDAY, JUNE 3 (8:00-9:00 p.m.) “Secret Millionaire” follows 13 of America’s most successful business people as they spend a week in the country’s poorest areas and ultimately gift deserving members of the community with hundreds of thousands of dollars of their own money. Originally based on the hit UK series of the same name, each episode follows one of America’s most successful business people for one week as they leave behind their lavish lifestyles, sprawling mansions and luxury jets, conceal their true identities, and go to live and volunteer in some of the most impoverished and dangerous neighborhoods in the country. Surviving on welfare wages, their mission is to discover the most deserving individuals who continually sacrifice everything to help those in need, and ultimately encourage others to do the same. Throughout this incredible, life-changing experience, the Secret Millionaires will attempt to remain undiscovered, coming face to face with extraordinary people battling the odds every day of their lives. On the final day, in an emotional and dramatic climax, they reveal their true identities. Ultimately, the millionaires will each give away a great deal of their own money, changing lives forever and encouraging others to keep giving back. “Secret Millionaire” is executive-produced by Claire O’Donohoe, Grant Mansfield, Natalka Znak and Leslie Garvin. Paul Osborne is co-executive producer. The series is a Zodiak USA Production. EXTREME MAKEOVER: WEIGHT LOSS EDITION – PREMIERES SUNDAY, JUNE 3 (9:00-11:00 p.m.) The hit series returns for Season 2 as transformational specialist and bestselling author Chris Powell documents the amazing makeover of eight courageous, “super obese” people who, in an unprecedented 365 days, set out to safely lose half of their body weight, ultimately revealing an amazing metamorphosis. In each of the eight stand-alone, two-hour episodes, the participants, whose ages range from 19 to 50 years, undergo a transformation not only of their bodies, but of who they are as individuals. By assuring that the participants have the proper nourishment and exercise movement, Powell provides a fresh perspective to individuals whose lives have become unmanageable because of their weight. He guides each of the eight participants through their transformation process by moving into their homes with their families or loved ones. The upcoming season is filled with remarkable and eye-opening changes, including one participant who loses 50% of his body weight, despite being homeless for most of the year. Another loses a staggering 142 pounds in the first 90 days, while still another will lose a grand total of 281 pounds over the year. In a show of support, one participant’s family challenge themselves to lose 500 pounds together. In 2012 Chris Powell became a bestselling author when his Hyperion book, Choose to Lose, hit No. 2 on the New York Times Bestseller List. From the producers of “The Biggest Loser” and “MasterChef,” “Extreme Makeover: Weight Loss Edition” is executive-produced by JD Roth, Todd A. Nelson and Matt Assmus. The series is produced by 3 Ball Productions/Eyeworks USA. WIPEOUT – PREMIERES THURSDAY, JUNE 28 (9:00-10:00 p.m.) Nothing says summer like completely new “Wipeout” courses, this year featuring the Panic Hammocks, Snakes on the Plain and Batter Up. Other featured obstacles making their debut are The Hangover, Spin Psycho, The Comma-Kaze and Spinergy. There’ll also be many specials this summer, including a salute to our Armed Forces, Bring your Teacher to Wipeout Day, and an All-Star episode of winners and losers. Returning are some of some favorite specials too, including Families, Hotties VS Nerds and Blind Date. “Wipeout” executive producers are Matt Kunitz (“101 Ways to Leave a Game Show,” “Fear Factor”) and Scott Larsen. Shye Sutherland, Kevin Wehrenberg, Trice Barto and J. Rupert Thompson are co-executive producers. The series is produced by Endemol USA. David Goldberg is chairman of Endemol North America. TRUST US WITH YOUR LIFE – PREMIERES TUESDAY, JULY 10 (9:00-10:00 p.m.) From the creators of “Whose Line Is It Anyway?” and “Mock the Week,” “Trust Us With Your Life” is a brand new studio-based improvisation series that redefines both the chat show and television improv formats. 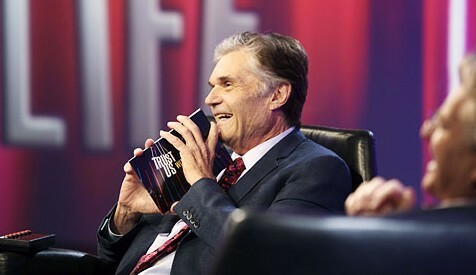 Hosted by Fred Willard (“Best in Show,” “Modern Family”), featured celebrities include David Hasselhoff, Ricky Gervais, Jerry Springer, Florence Henderson, Jack & Kelly Osbourne, Jane Seymour, Serena Williams and Mark Cuban. The exciting new format finds each celebrity reminiscing about key episodes that have happened in their lives, then brilliant improvisers acting out those moments which the celebrity has just described. These key moments in the life of the guest celebrity will be improvised as straight comedy or in game formats such as forward/rewind and sideways scenes. The tone of the show is friendly, funny and cheeky. Comedians on the show include Wayne Brady and Colin Mochrie (“Whose Line Is It Anyway?”), along with Jonathan Mangum (“Fast and Loose”) as the main improvisers. They will be joined by guest starring performers such as Greg Proops and Nicole Parker. Eight episodes were shot in London for ABC. “Trust Us With Your Life” is produced by Angst Productions. Dan Patterson (“Whose Line Is It Anyway?”) is executive producer. FINAL WITNESS – PREMIERES TUESDAY, JULY 10 (10:00-11:00 p.m.) What if a murder victim could tell you about their final moments? The voices of the dead come to life in this true-crime series which offers a unique look at some of the nation’s most shocking murders. Each of the seven episodes will examine one case from start to finish, taking viewers inside the murder from the victim’s point of view. “Final Witness” is a compelling hybrid of documentary and drama, featuring interviews with real-life witnesses, prosecutors, law enforcement, family and friends, along with riveting scripted scenes with actors, thrusting viewers into the heart of each crime. Shot around the world at the actual locations, infused with an indie-band soundtrack and told like a feature film, “Final Witness” creates an unforgettable look at the human psyche at its darkest. The series is produced for ABC by Lincoln Square Productions. Executive producers are Rudy Bednar and Christine Connor. BACHELOR PAD — PREMIERES MONDAY, JULY 23 (8:00-10:00 p.m.) Fan-favorites, arch rivals and villains from the hugely successful “Bachelor” franchise reunite under one roof for a second chance at love as ABC’s “Bachelor Pad” returns for a third season. For the first time, the show is upping the ante by opening up casting to the general public, and participants who have never appeared in a “Bachelor” franchise will be included. Will these fresh new faces be able to find romance? And which bachelors and bachelorettes from seasons past will rekindle old flames or ignite new ones? “The Bachelor,” “The Bachelorette” and “Bachelor Pad” are all produced by Next Entertainment in association with Warner Horizon Television. Chris Harrison (“The Bachelor,” “The Bachelorette”) hosts. Mike Fleiss and Martin Hilton are executive producers. What do you think? Will you be tuning in to ABC to see any of these shows this summer? More about: Bachelor Pad, Bachelor Pad: canceled or renewed?, Duets, Duets: canceled or renewed?, Final Witness, Final Witness: canceled or renewed?, Rookie Blue, Rookie Blue: canceled or renewed?, Secret Millionaire, Secret Millionaire: canceled or renewed?, The Bachelorette, The Bachelorette: canceled or renewed?, Trust Us With Your Life, Trust Us With Your Life: canceled or renewed?, Wipeout, Wipeout: canceled or renewed? Trust Us With Your Life: Pulled, As Good As Cancelled? So far I haven’t seen the first TV ad for rookie blue, so unless people accidently land on it or check the website how are they going to know its coming on. It is may 5th already and no advertising. They sure did advertise nyc22. I will be so mad if they do not renew because of lack of ratings. Rookie Blue and Bachelor pad are GREAT!!!!! Rookie Blue is my favorite summer show! Rookie Blue All the Way! Love Rookie Blue! Great show. Yayy so excited for another season of Rookie Blue!!! Please advertise rookie blue more. I would hate it if there wasn’t a season 4 or 5 and so on. I love this show. Even my husband loves the show. Besides Rookie Blue, no thanks ABC. To answer the question – nope. Won’t be watching.